There was once a time in America when the taboo around cannabis was all-encompassing, save for certain areas of the country famous for their counter-cultural scenes. Now, while some people might still be distrustful of the plant, the American mood is mostly one of curiosity or indifference, as indicated by numerous polls showing support for legalization at all-time highs. What was once confined to private homes is out in the open, with marijuana dispensaries, retail stores, and conventions. With the new public appreciation of cannabis, it’s become more socially acceptable to use cannabis as a libation at gatherings in a similar manner to alcohol. Cannabis dinner parties that were previously unheard of, for example, have grown immensely in popularity since the advent of recreational legalization. If you’re thinking about inviting guests over for a swanky marijuana-infused meal, here is everything you need to know. As with any event, proper planning is key to ensure things run smoothly. However, when dealing with cannabis, attention to detail is doubly important due to the potent nature of the party centerpieces involved. Make sure you do all research necessary on both the products you intend to purchase in composing your meal, as well as recipes and ingredients used. Most recipes can be modified to easily include cannabis, but when in doubt, it never hurts to conduct a search on how to best add it to a specific dish. There are many specific websites available for crafting delicious food with cannabis. When it comes to cooking with cannabis, most people probably think of brownies, cookies, or other baked delights as vehicles for potent experiences. However, with a little bit of creativity, cannabis can be added to nearly any food item in the process of preparation. A cannabis dinner party should be approached from an angle of impressing your attendees with an infused meal they have never encountered before. Edible pizzas, saucy pastas, or even stuffed turkeys are all within the realm of possibility, so don’t be afraid to use your imagination. One of the most important things to keep in mind when hosting a cannabis dinner party is the dose of marijuana to add to your dishes. Remember, edible cannabis is often much stronger than cannabis that is inhaled. Take this into account when plotting out the amount of bud to add to a recipe. Typically, about a gram of cannabis is considered an ideal amount when cooking a meal for a small number of guests. In certain situations, though, more cannabis will need to be added in order to scale the recipe for more guests or different cooking processes. It is also ideal to ask guests beforehand about the amount of cannabis they can typically handle. Inexperienced consumers will likely want to eat much less than those who have built up greater tolerance over time. Interested in a quality Des Moines dispensary that can sate your cannabis cravings? 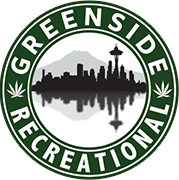 At Greenside Rec, we have friendly, knowledgeable staff on hand to assist with any of your questions or concerns. Plus, you can easily order ahead with our online dispensary menu.